Very nice, but no whoa. Good music, blurry cubes... Not bad! But not good either. Close encounters of the purple kind. This is what I'd call "degelijk" on a Dutch site but I don't know the English equivalent. Yet another 4k intro, certainly not bad but not something I'd remember later either. Nice graphics, ok music, but poor synth. added on the 2008-08-28 11:17:20 by ɧ4ɾɗվ. a couple of really cool looking graphics in here. the sound is weak though. the new screenshot is no improvement. Music is so fuckung awesome! Can you, please, upload a soundtrack? 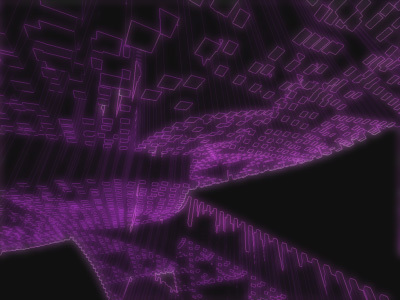 Too much good purple/pink, cool edge detect filter and fitting music. nice visuals including cool tune :) great show! great prod, loved the music! What Bitbuster said - but it's a thumb for me. good looking filters! lacks some substance to it, but I recon you'll be back hitting with more force next time. Cool, I like it very much, only too repeative before end. I found this to be quite nice. i guess it would be ok if you have the latest i7 core and hyper gfx. but why should you need that for a line demo? runs about 10fps on my duel Xeon 2ghz Nvidia 6800GT, and to me that should be more than enough. traction in 4k is a good thing. Great music for a 4K! Music is really great for a 4k - like it!